Who can do aerials and or circus? Well anybody that wants to give it a go. We have a lot of experience coaching all ages and skill levels and we cater to you. We all come from different backgrounds and some of us have played sport or danced since we were little, some may have never done any kind of physical sport or dance activity and some of us are in the middle, used to do stuff but not for a while.. The fantastic thing about aerials and circus is your improving your fitness and mental agility, while your getting acquainted with the various apparatus and attempting to learn the tricks of the trade. It's also a great cross training activity to co-inside with other sports. 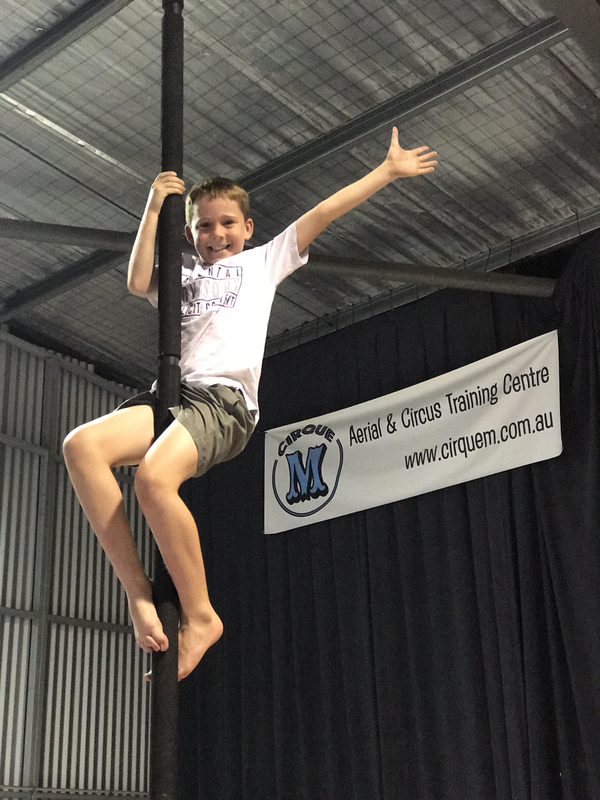 Circus and aerials help you improve core strength, body control, spatial awareness and well, it's just plain fun! For booking into any level 1 or beginner class, no experience is needed. All classes do a guided warm up, conditioning and cool down as part of your class. If your body is coming back into action after a period of hibernation then the aerial body conditioning prep course may be for you. If you can lift yourself off the ground and are already up and at em with other activities, then level 1 aerials would be a great start. As the timetable grows into higher levels, you will need to consult with your instructor before enrolling into a higher level. Anything that is comfortable and easy to move around in. So T-shirt and 3/4tights are good or skins with shorts over the top. It is preferable that you have your underarms covered and the backs of your knees as well. In summer, wear summer workout gear but bring some long tights or extra pair of tracksuit pants for when you need to cover up. Also ladies please not that the latest training tights that have zippered back pockets are not allowed on the silks as we have found that the zipper can tear a hole in the silks. No belts, ankle jewellery, long earnings, necklaces or rings may be worn on. Any medications you may need such as a puffer or epipen or diabetic aids. Unfortunately no. If you know before term starts though, that you are going to be away for a few consecutive weeks, all is not lost! Let us know so we can put you on a standby list and if by week 1, we don't sell out of spaces, we can put you on at pro-rata and you pay for only the weeks you attend. We do not offer a payment plan. All classes must be paid for prior to the term commencing to secure your place. We do however, understand that everybody's circumstances can vary at times and Cirque M reserves the right to review a request at our discretion. What happens during public holidays? Everyone enjoys the breaks, and we are no exception! We have left a spare week at the end of each team where if a class falls on a public holiday, we reschedule at the end of term. Where possible, we do this is on the same day and time as your class. If there is no day and time that is the same as your class available we run the class on the public holiday so the class term can still run as a 9 week term.